The video clearly shows that the iPad 5 design is based on the iPad mini (current version). Being a 9.7″ tablet, it’s a bit too big to hold in one hand, but is a good deal narrower than the old model. And it’s thinner than even the iPad 2 at only 7.2mm, that’s the same thickness as the current iPad mini. 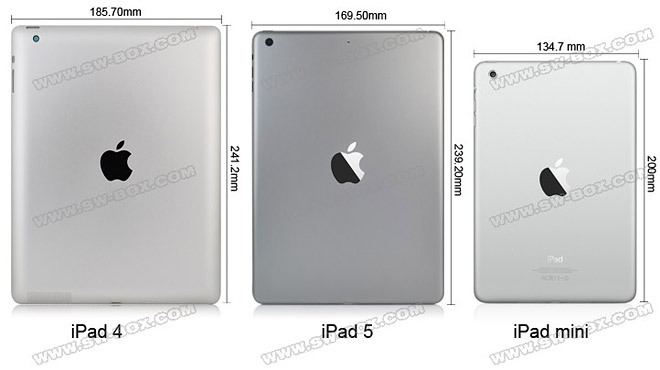 The other dimensions of the iPad 5 are 239.2 x 169.5mm, compared to 241 x 185.7mm for the iPad 4. The aluminum body is lighter by about 50g, going down from 146g on the current model to 92g on the unannounced iPad 5. This means we can expect the new one to be at least a little lighter (these weights don’t include the internal components). A few more differences include a different bevel on the edges, similar to that on the iPad mini, the speaker has been moved to the bottom like on the mini and iPhone 5 and one of the mics has been moved to the back, near the camera. The volume rocker is now two separate buttons, like on the iPhone 5c. The video also shows a snap-on back cover for the iPad 5 that’s very different from the current Smart Covers. As with all leaks, take this with a grain of salt (though the iPhone 5s/5c rumors were fairly accurate).